Bartek Ciszewski: How did Campsited start? Finán O'Donoghue: One day, I went online to book a family camping holiday. I expected to find lots of easy-to-use websites to help book the trip. My experience however was excruciating. I spent hours trawling through dozens of websites. None were really easy-to-use, had a global view of campsites, or a comprehensive choice of bookable campsites around the world. When talking to others afterwards, I was overwhelmed by the number of people who had the same difficult experience. So I decided to do something about it, and got to work creating Campsited to be the easiest way for anyone to find and book campsites around the world. Bartek: What was the biggest challenge in creating such an application? Finán: We knew we had to build an easy-to-use booking engine, tailored carefully for parks and their customers. To do this we brought together a great team with thirty years of combined experience making user-friendly websites. Finán: I started my project partnering with local Ruby on Rails developers. However, after our initial implementation I realised we needed to scale our development capability. Speed of execution was a top priority. In addition all of our regression testing was manual. We needed to get to a point where this was fully automated. In addition to this, IT resources in Ireland are always in very high demand. As a result developers are scarce and often expensive for an early stage company. That prompted me to look abroad. I found Netguru through Google search. The strength of Netguru clients’ references made the decision very easy for me. Bartek: How did the project go? Finán: We started planning in October and development began sometime in December 2015. In March 2016 we released a completely redeveloped version of half of the Campsited application. I was very impressed with the speed and quality of execution. We had our UX designer in Ireland, and a visual designer in Ukraine. Netguru were responsible for both the front-end and back-end development. In May 2016 we released a redeveloped version of the second half of the application. In this short time we were able to refactor and rewrite almost all the code, introduce new layouts, an admin panel with enhanced functionality, and a completely new consumer experience. 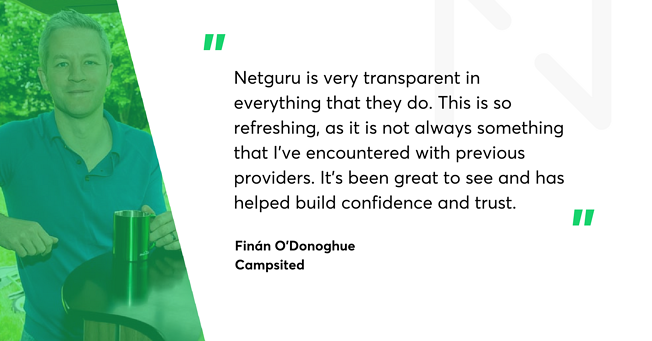 Bartek: What was your experience when working with Netguru? Finán: I was coming from a situation where we had challenges with throughput and visibility. Here I have both. The planning is easier, because I can predict outcomes. The development of Campsited is a team effort, exactly the way it should be. In Netguru I have my dedicated team - developer, quality assurance specialist and PM, and one of them is always available. I like the communication methods and processes in Netguru. The overall feeling is that Netguru are not a separate company but part of one Campsited team. Another great thing is flexibility. When we were approaching the release date of the new Campsited app I could have up to 5 developers working at the project at the same time. Now we're down to two. This couldn't have been done internally without a remote team. Bartek: Any advice for people looking for development teams? Finán: Speak to as many clients as possible – and look for completed projects of a similar scale and complexity. Only this way can you can be sure that your chosen partner will be able to deliver for you. Bartek: How is Campsited doing at the moment? Finán: We've got over 1,300 registered campsites from Ireland and the UK alone. We started expanding to Europe, with the first campsites from The Netherlands joining. And with plenty of additional products to bring to the market we’re looking forward to another exciting 12 months. The market is big and growing. By 2020, we estimate that well over 450 million nights will be spent at camping, touring and holiday parks in Europe alone. To date we've had one significant round of investment. We are currently raising again, to grow the full time time and finance the business for the next 18 months. Netguru is very transparent in everything that they do. This is so refreshing, as it is not always something that I've encountered with previous providers. It's been great to see and has helped build confidence and trust.